High Impact Practice:Provide vouchers where financial and information barriers impede access to modern methods of contraceptives. reduce inequities in access to essential services among low-income and underserved groups by reducing financial and information barriers (Ensor, 2004; Standing, 2004). By targeting underserved groups, vouchers ensure subsidies reach the disadvantaged and are not absorbed by those with greater access to resources. Figure 1 depicts a theory of how contraceptive voucher programs influence client and provider behaviors. Health care voucher programs can be designed to increase access to one or more sexual and reproductive health (SRH) services. The majority of voucher programs contract with private and/or public health care providers in an effort to facilitate access to services that are well-defined and time-limited and that reflect the country’s stated health priorities. Although there are many variations in the design and implementation arrangements, voucher programs share a number of important characteristics: they have a funding body (e.g., government and/or donors), a governance structure that oversees the program, and an implementing body (e.g., voucher management agency or VMA). This brief describes how vouchers can address key challenges for family planning programs, discusses the potential contribution to improving the quality and use of contraceptive services, outlines key issues for planning and implementation, and identifies knowledge gaps. This brief does not cover other financial mechanisms, such as conditional cash transfers, that may also serve as effective approaches for facilitating behavior change and reducing financial barriers. Provision of contraceptive vouchers is an emerging “high-impact practice in family planning” (HIPs) identified by a technical advisory group of international experts. Although emerging HIPs have a strong theoretical basis, they have limited evidence to assess impact (HIPs, 2014). Therefore, emerging HIPs should be implemented within the context of research or an impact evaluation. For more information about HIPs, see http://www.fphighimpactpractices.org/overview. Which challenges can this practice help countries address? Vouchers can improve targeting of subsidies and remove financial barriers to services, particularly to long-acting reversible contraceptives (LARCs) and permanent methods (PMs). Vouchers can offset the higher out-of-pocket costs of LARC and PM provision for users, expanding contraceptive choice. In Pakistan, a maternal and family planning voucher program provided women with access to a wide range of methods including, LARC and PM. Of the voucher clients who were counseled on family planning, one third chose no method at the time of counseling, one third accepted short-term methods (pills, condoms, or injectables) and one third accepted LARCs or PM (Bashir et al., 2009). Vouchers can drive service quality improvements. Two recent systematic reviews found some evidence that voucher programs can improve the quality of service provision (Bellows et al., 2011; Brody et al., 2013). A voucher accreditation process establishes a high standard of care and assists in developing capacity to measure and monitor the quality of health services. Voucher reimbursements offer providers a steady flow of income that can be reinvested in improving services. For example, in Kenya 85% of public-sector providers, 89% of providers working in for-profit clinics, and 67% of nonprofit providers used revenue from voucher reimbursement to improve infrastructure, buy equipment or drugs and supplies, hire new or pay existing staff, or create patient amenities (Arur et al., 2009). A program targeting adolescents in Nicaragua found that voucher program providers had better clinical knowledge, improved provider practices, and, to a lesser extent, improved provider attitudes toward adolescents’ use of SRH services compared with providers not involved in the voucher program (Meuwissen et al., 2006a). User satisfaction was significantly higher among adolescents using vouchers than among non-voucher holders (Meuwissen et al., 2006b). Vouchers can expand access to private-sector facilities. Some groups, such as low-income individuals or adolescents, may prefer accessing contraceptive services through private facilities due to a perception of higher quality and greater confidentiality than in the public sector (Health Policy Initiative, 2010), yet they lack access to private facilities due to user fees. Vouchers address this barrier by subsidizing user fees. Engaging the private sector can also expand geographic coverage and/or access to a wider choice of methods (Mishra et al., 2011). For example, in India and Pakistan, voucher programs have been used to expand private-sector access to LARCs that are unavailable in public facilities (Khurram Azmat et al., 2013; ITAP, 2012). Vouchers may serve as a stepping-stone toward social health insurance. Theoretically, vouchers may help governments develop their capacity to purchase health services (accreditation, pricing, contracting, quality assurance, monitoring, claims processing, and reimbursement) and to target subsidies to underserved populations (Sandiford et al., 2005). In the Philippines, the government and the World Bank are currently working to integrate vouchers with the PhilHealth national insurance scheme (Llorito et al., 2012). Vouchers may increase accountability and reduce fraud. Separation of the management agency (VMA) and implementers (providers) can increase transparency, allow for independent verification of service delivery, and help curb informal payments. Prices are often not fixed or displayed at facilities, which deters households that prefer fixed charges (Borghi et al., 2004). The voucher addresses this information barrier, offering greater “price assurance” and transparency to beneficiaries. The incidence of fraud reported in voucher schemes is relatively low, although it may be under-reported (Kemplay et al., 2013). Voucher management agencies are charged with putting in place mechanisms to prevent, detect, and deal with fraud, should it occur in the program. The physical record of service provision, in most cases a uniquely numbered paper voucher, makes auditing easier, giving these programs a strong accountability mechanism. Other common checks and balances to counteract fraud in voucher schemes include periodic analysis of trends in vouchers distributed and claims made and use of spot checks. In addition, contracts enable the VMA to exclude providers from the program or to enact other sanctions for fraudulent behavior. In many countries including Armenia, Cambodia, Kenya, and Uganda, providers must pass an accreditation process before being contracted by the voucher program. However, where contracts are not well-enforced or where there is poor supervision, there is a higher risk of fraud. Do not pay clients or give them any benefits in exchange for accepting a method. Do not deny clients a benefit if they choose not to accept family planning. Offer family planning counseling before issuing the family planning voucher. Ensure clients are counseled about contraceptive methods again at the clinic when they present for services. Monitor health care providers for family planning service quality measures as well as provision of a method. Consider rewarding facilities or teams to attain performance objectives specified as number of clients counseled, or number of new clients accepting contraceptive methods. Goals should not be distributed to individuals or specified for specific methods. Do not provide payments for delivery of specific contraceptive methods that are out of line with payments for other services. Ensure compensation levels for contraceptive methods are realistic to cover costs of quality care, including the costs of consumables and supplies, the contraceptives themselves, and provider time. Vouchers likely increase use of modern contraceptive methods. Voucher programs played a key role in the evolution of several highly successful family planning programs, beginning in Korea and Taiwan in the 1960s (Chow et al., 1969; Ross et al., 1970; Cernada et al., 2006-2007). More recent findings from family planning voucher programs show either positive or null effects; there are no known studies that document negative effects. Table 1 provides the modern contraceptive prevalence rate (mCPR) for communities before and after voucher programs were implemented or from comparison communities that were unexposed to voucher programs. The voucher schemes all targeted the poor. Of these programs, only those that provided vouchers free of charge to beneficiaries demonstrated a significant increase in mCPR, although the total sample represents only a small number of programs. The two studies with null effects did note increases in mCPR, but they were not statistically significant. Through well-designed targeting, vouchers may increase access to contraceptive services among the poor and adolescents. A voucher program in rural India led to an increase in mCPR among women living below the poverty line, from 33% to 43% (ITAP, 2012). In Nicaragua, adolescents who received vouchers were three times more likely to use SRH centers, twice as likely to use modern contraception, and 2.5 times more likely to report condom use at last sexual contact compared with adolescents who did not receive vouchers (Meuwissen et al., 2006). Select an appropriate distribution option. Voucher distribution involves identifying members of the client population in a way that is low cost, respectful of the client’s confidentiality and needs, and timely for the beneficiary. Programs have used two basic strategies: they either have hired community-based distributors (CBDs) specifically for this task or have worked with existing community health workers (CHWs) who are often assigned to a health post and catchment community. Remuneration for CBDs can be more flexible as they are hired specifically for the voucher program. To ensure voluntarism and informed choice, commissions for voucher sales should be accompanied by a stipend or salary payment. Compensation should not be based solely on voucher sales. Voucher programs that employ existing CHWs should work within current policies to ensure that compensation for CHW participation is in line with other obligations. Choose providers carefully. When selecting providers for a voucher scheme, it is important to use a quality assurance framework and to consider the geographic accessibility and providers’ technical readiness with respect to the target population. Providers will consider their own cost and revenue estimates to decide whether to opt into the voucher program. In most markets, some providers decline to participate in the voucher program because they think the reimbursement price for services rendered is too low. Others realize that higher client volumes through the voucher program can offset the lower remuneration received compared with the prices they charge to the few independent walk-in clients. Providers are usually selected according to compliance with minimum quality standards and agreement on reimbursement rates and location, and they come from the private sector, NGOs, and the public sector (Bellows et al., 2013; Grainger et al., 2014). Consider provider autonomy when working with public-sector providers. Some public-sector voucher providers may lack full autonomy to organize service provision according to the requirements of the voucher program, including the ability to hire and fire medical staff (Grainger et al., 2014). Publicsector facilities may also be unable to receive direct reimbursements from the VMA for voucher services rendered or be able to make decisions on how to utilize revenue for service quality improvements, reducing incentives to participate in the program. A voucher program in Cambodia working with public-sector providers was able to negotiate with the government to make payments, or a portion of payments, directly to facilities. In Kenya, some public-sector voucher providers have been able to invest a growing proportion of their voucher income in improving service quality (Abuya et al., 2013). Bundle contraceptive services, which can be particularly important for adolescents and unmarried women. Including a range of services in a voucher program can ensure confidentiality and better meet the needs of underserved populations. Most contraceptive voucher programs also offered at least one other SRH service; maternity care and sexually transmitted infection (STI) treatment services were the most common (Grainger et al., 2014). Table 2 provides some examples of different service packages in recent voucher programs. Facilitate voluntary contraceptive choice. Voucher programs aim to reduce financial barriers to family planning provision and improve voluntary access to contraception. Specifically, contraceptive vouchers are intended to address a client’s inability to pay for the method of their choice and ensure that trained providers are not restricted from offering a range of contraceptive methods due to the difference in costs, varying consultation and service times required by different methods, additional supplies or equipment needed, and adherence to quality of care measures. Because clinical methods generally incur greater costs to provider and client, voucher programs may focus on offering voluntary LARCs and PMs to level the cost of these clinical methods with less expensive methods or to increase access to these underused methods. Still, health system managers must ensure access to a broad range of methods (Eichler et al., 2010). Approaches for achieving this include voucher distribution agents offering short-acting methods if they are trained; referring women seeking short-acting methods to the closest service point that stocks them; ensuring that the cost of a voucher is roughly the same as the cost of a pill/injectable at a public facility; and/or ensuring that women can access their method of choice through the voucher, regardless of what they choose. Voucher program managers can assess provider performance by monitoring the availability of a range of methods in the provider’s clinic, evaluating whether the provider counsels voucher holders when they present for services to facilitate method choice, and evaluating the overall quality of the service that providers offer to voucher holders. Use vouchers as part of a larger social behavior change communication strategy. 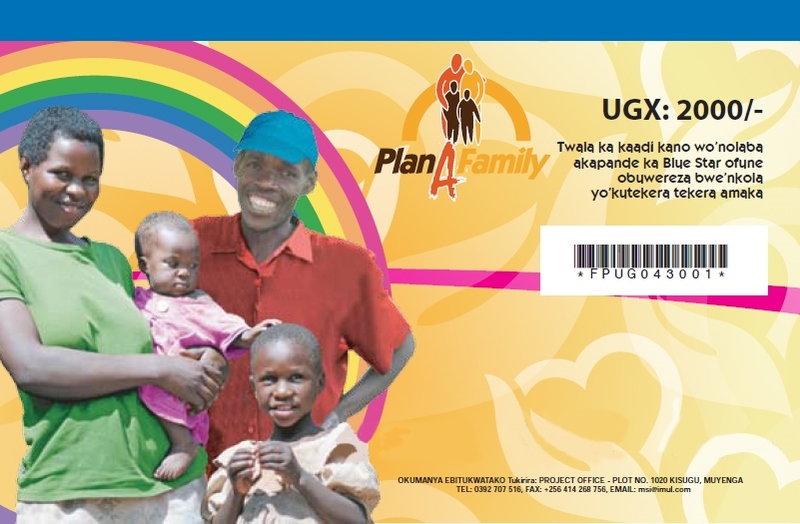 Vouchers can be used to provide information on family planning and where contraceptive methods and services are available. They can be distributed door-to-door or through community meetings, enabling prospective clients receive information and ask questions in a more relaxed setting. In Uganda, social and behavior change communication activities and materials include local launch events, radio call-in shows, posters, and pamphlets (Boler and Harris, 2010). In Cambodia, health promoters work with the local government to identify Health Equity Fund beneficiaries who qualify for voluntary contraceptive voucher services (Bajracharya and Bellows, 2014). In Pakistan, CHWs engage in outreach within their catchment area, educate clients on health topics including family planning, and distribute vouchers (Khurram Azmat et al., 2013). Target resources to underserved populations. Nearly all voucher programs use some form of beneficiary identification to channel resources to an underserved group as an attempt to address large inequities in access. The most commonly used mechanisms are poverty assessment tools in the form of a questionnaire, a preexisting poverty identification system such as those used in India (the “below poverty line,” or BPL, card) or Cambodia (the Poor ID Card), or geographic targeting of areas identified as poor. Debate is ongoing about the relative benefits of means testing, which can be expensive and time-consuming, and geographic targeting, which is less accurate but entails much lower costs (Gwatkin, 2000; Hanson et al., 2006). Decide whether to use paper vouchers or e-vouchers. The paper voucher has a number of functions including providing information about the service and where it can be obtained. It acts as evidence for the client and the clinic that the client has the right to receive the services for free, thereby helping to prevent informal payments. It also acts as a data collection form and provides documentation for monitoring and evaluation. In areas with high rates of cellular phone use, there is growing interest in using electronic vouchers, or e-vouchers. In Madagascar, franchise providers were trained on youth-friendly service provision while CHWs raised awareness of contraceptive options and sent free vouchers via SMS to interested youths. Adolescents redeemed the voucher for a package of SRH services of their choice, and providers received reimbursement via mobile money. Each month, 3,000 adolescents redeemed the voucher for contraceptive and STI services. Of those obtaining a contraceptive, just over half chose a LARC (MSI, 2014). The decision about paper versus electronic vouchers ultimately depends on local context, markets, and available resources. What is the effect of voucher programs on contraceptive dis/continuation rates? How cost-effective or efficient are client-fee versus free contraceptive voucher programs? What is the added value of a voucher program where contraceptive services and commodities are free? Are voucher programs more effective than alternative strategies at reaching underserved clients, such as poor or adolescents with contraceptive services? How can voucher programs be designed to be sustainable? Financial barriers restrict access to contraceptives among a specific underserved client group. There is at least one, but optimally more, providers with the capacity to provide contraceptive services, particularly LARCs and PMs. Eligible clients can be effectively identified and reached. Capacity and commitment of resources exists to build a management system. Provider reimbursement is not set appropriately. Providers are not reimbursed in a timely manner. Definition of what is included in the voucher service package is imprecise. Ability to verify service delivery is limited. Reproductive Health Vouchers: From Promise to Practice presents key implementation lessons drawn from Marie Stopes International’s experience in setting and managing reproductive health voucher programs in various settings. Available from: https://mariestopes.org/sites/default/files/vouchers-from-promise-to-practice. Abuya T, Sanghrajka S, Warren CE, Obare F, Kanya L, Askew I, et al. Health facility spending patterns of reproductive health voucher reimbursement revenue among accredited facilities in Kenya. Nairobi: Population Council; 2013. Bajracharya A, Bellows BW. The impact of a reproductive health voucher program on increasing uptake of long acting reversible contraceptives and permanent methods in Cambodia: evidence from a difference-in-difference analysis. New York: Population Council; 2014. Bashir H, Kazmi S, Eichler R, Beith A, Brown E. Pay for performance: improving maternal health services in Pakistan. Bethesda: Health Systems 20/20; 2009. Brody CM, Bellows N, Campbell M, Potts M. The impact of vouchers on the use and quality of health care in developing countries: a systematic review. Glob Public Health. 2013;8(4):363-388. Cernada G, Sun TH, Chang MC, Tsai JF. Taiwan’s population and family planning efforts: an historical perspective. Int Q Community Health Educ. 2006- 2007;27(2): 99–120. Eichler R, Seligman B, Beith A, Wright J. Performance-based incentives: ensuring voluntarism in family planning initiatives. Bethesda, MD: Health Systems 20/20; 2010. Ensor T, Ronoh J. Effective financing of maternal health services: a review of the literature. Health Policy. 2005;75(1):49– 58. Marie Stopes International (MSI). Increasing youth access to voluntary family planning information and services through e-vouchers in Madagascar. Forthcoming 2015. Meuwissen L, Gorter A, Knottnerus A. Impact of accessible sexual and reproductive health care on poor and underserved adolescents in Managua, Nicaragua: a quasi-experimental intervention study. J Adolesc Health. 2006;38(1):56. This document was originally drafted by Ben Bellows, Elaine Menotti, and Shawn Malarcher. Critical review was provided by Moazzam Ali, Michal Avni, Monica Bautista, Adrita Bhattacharya-Craven, Clarissa Lord Brundage, Nirali Chakrabort, Elaine Charurat, Kimberly Cole, Laurette Cucuzza, Peggy D’Adamo, Alicia Diaz, Antonia Dingle, Ellen Eiseman, Mychelle Farmer, Mario Festin, Sarah Fox, Howard Friedman, Jennifer Friedman, Jay Gribble, Dale Huntington, Sandra Jordan, Joan Kraft, Marcy Levy, Isabelle Lindenmayer, Ricky Lu, Anna MacKay, Jacqueline Mahon, Elaine Menotti, Erin Mielke, Susan Mitchell, Nuriye Ortayli, Gael O’Sullivan, Tanvi Pandit, Jennifer Pope, Caroline Quijada, Suzanne Reier, Elaine Rossi, Diana Santillan, Emma Shmautz, Patricia Stephenson, Sarah Thurston, Thierry van Bastelaer, and Marisa Van Osdale. This HIP brief is endorsed by: Abt Associates, Bill & Melinda Gates Foundation, Chemonics, EngenderHealth, FHI360, Futures Group, Georgetown University/Institute for Reproductive Health, International Planned Parenthood Federation, IntraHealth International, Jhpiego, John Snow, Inc., Johns Hopkins Center for Communication Programs, Management Sciences for Health, Marie Stopes International, PATH, Pathfinder International, PLAN, Population Council, Population Reference Bureau, Population Services International, Save the Children, and the U.S. Agency for International Development.